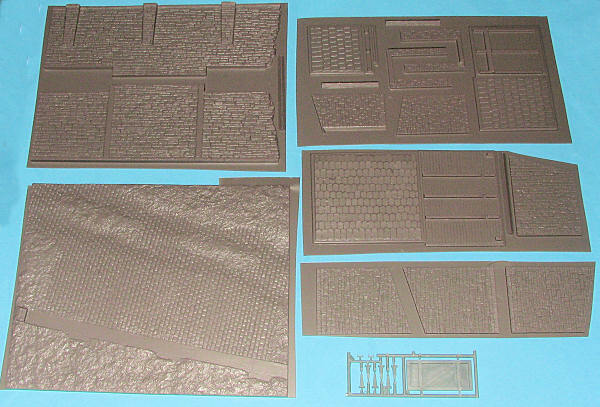 Here is another of MiniArt's fine vacuformed diorama bases. 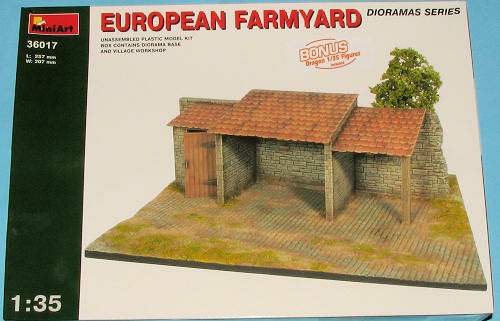 This time, it isn't something that has been knocked into rubble, but a rather complete European Farmyard. Actually a sort of stable with an attached shed. As you can see from the box photo, it has a tile roof and stone walls with a stone courtyard that is overgrown with weeds. The track in front of the structure is depresses as if a lot of wheeled traffic has gone through there over the ages. As with all of MiniArt's structures, this one is basically very thick vacuformed plastic. This stuff can be handled just like standard polystyrene once you cut out the pieces. It also has the benefit of not being heavy, something that a polystyr ene structure would be. The kit also comes with a set of Dragon figures. These are items that are excess inventory as they come with photo-copied cover/instructions. 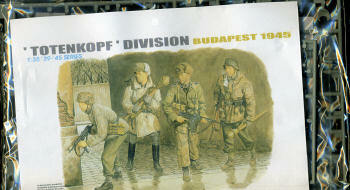 The set is #6095 'Totenkopf Division. and includes four figures. The Farmyard does not come with animals and for Knights of Nikt, there is no shrubbery. Overall, a fine diorama base that has a myriad of uses.